The cartilage is a blank canvas and you can create many different images using different size and shaped barbells. One of the most unique cartilage piercing is the image of falling flower petals. A piercer will use a Flower end on a barbell on the upper piece of the cartilage and then a smaller flower end right below this. After the two flowers, there is a series of single circular barbells with a bezel setting (that matches the colors of the upper flowers). These are done in a cluster below the two flowers going down towards the bottom of the ear, creating a swirl effect. Each bezel becomes smaller in size as the piercings get lower, creating a “falling effect”. The bezel ends can be done in a variety of colors to show contrast and movement as the piercing descends. This piercing is extremely versatile! It can be done as a “double” tragus – two separate horizontal barbells going through the tragus (giving the effect of one piercing) – or as a single piercing with different bezels or shaped ends. For example, an arrow or a star end can be attached to the barbell to create different designs. 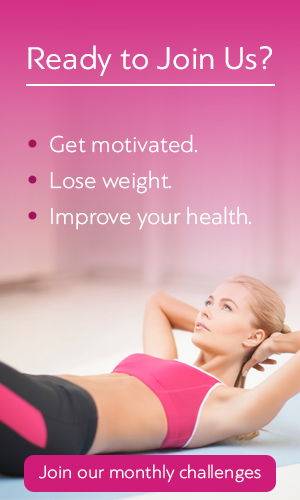 The options are practically endless! Instead of using the regular circular barbell, the anti-helix can be pierced with a barbell in the shape of a heart. This involves two single piercings angling down on the anti-helix connected by one piece of jewelry. When the jewelry is inserted, the bottom piece of the heart is on the inside of the ear, and the top pieces of the heart are on the outside. The anti-helix isn’t the only place you can replace a circular barbell. 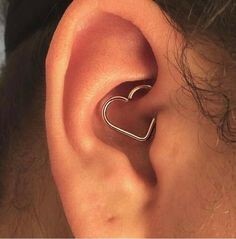 The Daith is traditionally done with a circular barbell or a curved barbell, but a heart can be inserted instead. The straight side of the heart goes through the actual piercing and gives the appearance that the heart is inter-woven into the ear. The trident piercing is a creative change from the basic industrial piercing. 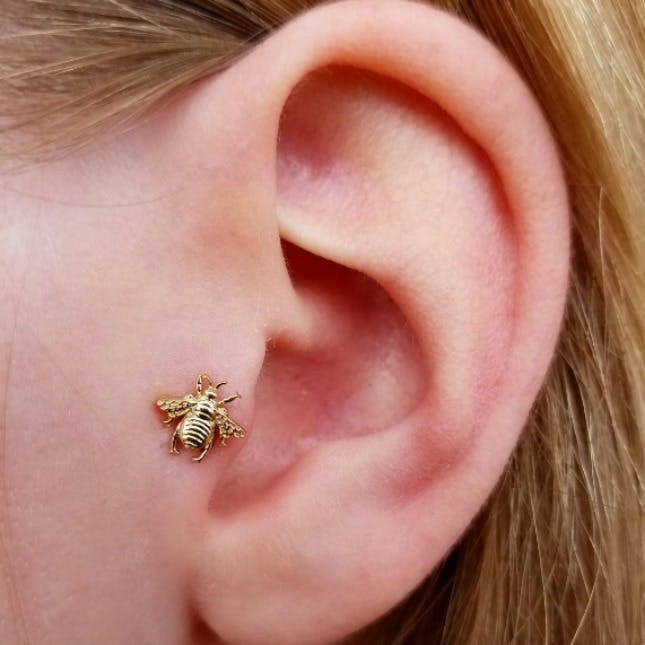 This piercing is customized to the shape of the ear. The first piercing is a straight vertical barbell that goes from the upper helix into the conch. The top of the vertical industrial has a spiked end for the top of the ear, and a regular ball at the bottom. The next piece of the piercing is a curved industrial. The barbell is curved into a “U” shape and it goes through the antihelix. 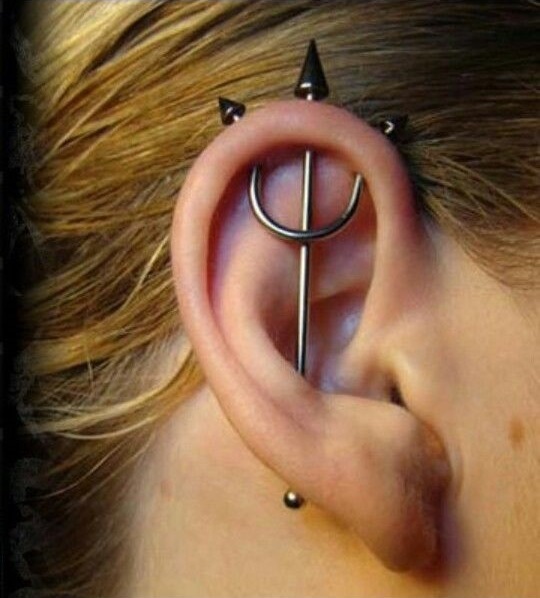 The end pieces to this barbell are spikes, they finish the trident look! 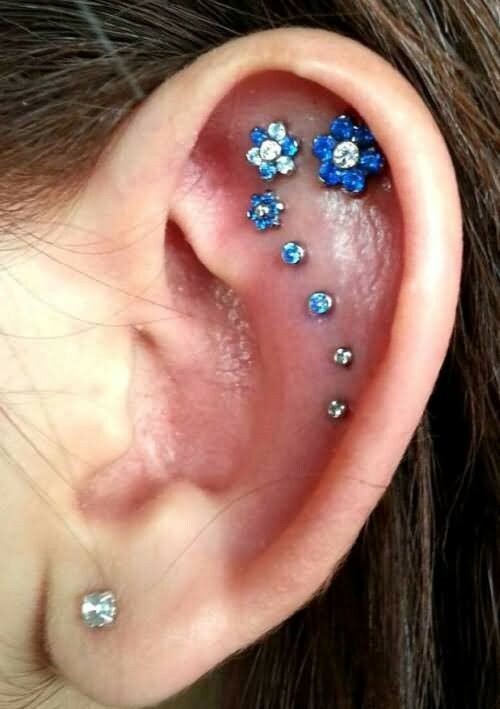 These are just a few examples of amazingly creative cartilage piercings you can get! You can choose your jewelry and piercing to express yourself exactly as you want. As we said, healing times can vary and proper aftercare is extremely important. Now go out and express yourself with a new cartilage piercing!